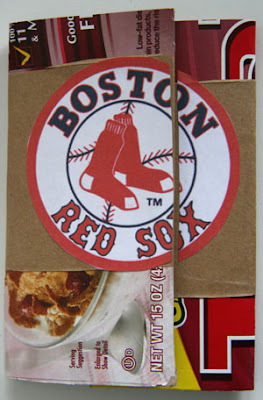 Last year I was making books at the Bryn Mawr Elementary School in Auburn, MA on Opening Day of the Red Sox at Fenway Park. Everyone was dressed in Red Sox garb and the school cafeteria served hot dogs for lunch. One class made a Who Am I? Book and most of the class planned to make their books about Red Sox players. It is a reminder that children need to spend time writing about their loves and interests as well as curriculum material. This month's links are websites relating baseball and curriculum, but children can make books about their favorite stars of other sports, bands and singers, actors, actresses, dancers, and musicians. I made my book from the back panel of a grocery bag (the one without any writing). I used a cereal box for the cover and velcro instead of yarn. 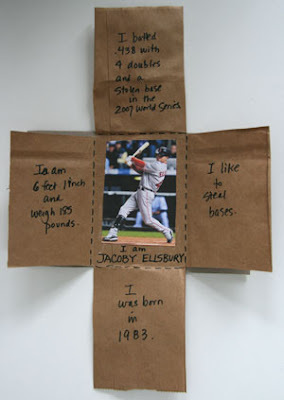 It's about one of my favorite Red Sox players, Jacoby Ellsbury. A good place to research players and teams. Education World has a page with lots of links to sites for using baseball across the curriculum, including the text of Abbott and Costello's Who's On First? and several sites for baseball math. Lots of good stuff including how to find the sweet spot on a bat, an experiment with bouncing and temperature, how to throw different pitches using a styrofoam ball, and much more. Answer addition, subtraction, multiplication, and division problems and hit the "Swing" button. Correct answers are hits. Whether it is a single, double, triple, or home run is based on the difficulty of the problem. Wrong answers are outs and the game lasts for three outs. There is a choice of levels from easy to superbrain and it can be played with one or two players.